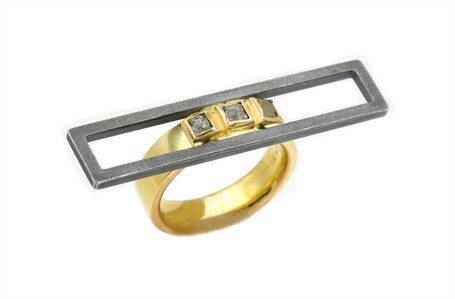 In 1975 Janis Kerman had completed her fundamental studies in jewelry design and began experimenting with various metals and techniques. She knew that jewelry making was her direction, her métier. Two years later Janis Kerman design was established. The focus of her work for the next 13 years was the design and production of limited edition collections, detailing for fashion accessories and unique pieces. Though she enjoyed the production years and the fact that her designs were available to many, her need to focus on one-of-kind designs was determining the next era of work. Since 1988, she has been working exclusively in precious metals, gems and alternative materials. Kerman believes there is a symbiotic relationship between fine art and design – a conceptual fluidity where influences move freely between disciplines promoting exchange and evolution. Inspiration comes from color, texture and objects both artistic and common: architecture, furniture, paintings, ceramics, and fashion. My work seeks to define a new relationship between geometric shapes and organic forms, through balance, not symmetry.